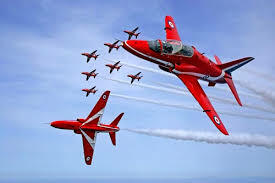 Exclusive: BRITAIN’S famous Red Arrows are set to carry out a spectacular aeronautical display in the skies above Donegal, Donegal Daily can reveal. Donegal County Council has joined Derry City Council and Limavady Borough Council to host the incredible event. It will take place over Lough Foyle on Sunday June 29 to coincide with the end of the Clipper Round the World Yacht Race. We understand the event will be officially announced in Greencastle this Friday – where the displays will officially begin before heading up the Foyle to Derry City. The events – along with the end of the race – is expected to draw thousands of spectators to the Inishowen side of the Foyle. The Red Arrows badge shows the aircraft in their trademark diamond nine formation, with the motto Éclat, a French word meaning “brilliance” or “excellence”. “This is massive for us,” said one chuffed Donegal County Council official.